Kick Start the New Year, Move in for just $1 / RM1! 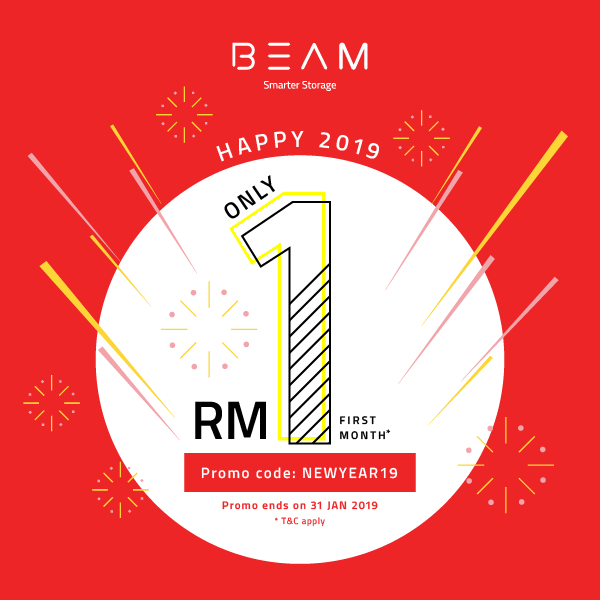 Kick start your 2019 with BEAM! Move in with us for just $1 / RM1 for the first month when your store for the first time or add to your existing storage. Promotional discount amount will be determined by adding storage charges above and beyond your existing monthly billing amount for existing customers. Offer applies and is valid until 31 January 2019. Promotional credit to be issued following two months of paid storage at regular rates. Customers cannot downgrade their sq. ft. plans or use fewer standard boxes throughout the 4-months minimum storage. Logistics fees and other surcharges are not covered by this offer. Other discounts cannot be used in conjunction with this offer. By-The-Item offer applies to standard boxes only, and excludes wardrobe boxes, document boxes or oversized items. For upgrade to a larger sq. ft. plan, the difference in standard retail price between the plans applies. BEAM reserves the right to make the final decision. To enjoy this offer, download the BEAM Space mobile app for iOS or Android or login through the BEAM Website and enter the promo code ‘NEWYEAR19’. Call us on +65 3163 9213 (SG) / +60(3) 9212 1586 (MY) or email us if you still have any questions and our friendly concierge will guide you thru.